Plot: +1/+1 for each other card you've played this turn. Balmora Puppeteer is a rare House Hlaalu creature card. It is part of the Houses of Morrowind expansion. "If you wanna talk business, you've come to the right place." "You've meddled in our business for the last time." This card's plot ability applies the Master card effect. 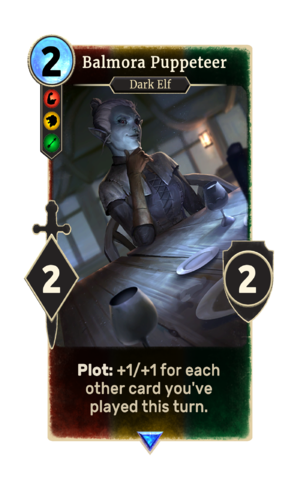 The card depicts Nileno Dorvayn, who also appeared in Morrowind. This page was last modified on 2 March 2019, at 00:46.